Ten years ago, Alain Arakaza can remember washing his clothes in a Nairobi river. He and his family fled to the East African country in 2007 because of the civil war that had broken out in nearby Burundi. Now, he's about to become a Toronto police officer. If you're anywhere on social media, you've seen the #10YearChallenge. Haven't heard of it? It's the reason everyone seems to be posting before and after photos of themselves from a decade ago — from celebrities to your friends and maybe even your mom. Well, one Toronto police cadet just might be your biggest competition. Ten years ago, Alain Arakaza can remember washing his clothes in a Nairobi river. He and his family fled to the East African country in 2007 because of the civil war that had broken out in nearby Burundi. They stayed there for two years. "It wasn't easy," Arakaza told CBC News. Getting groceries meant having to walk for miles. Making dinner meant cooking on coals. "We went through some days without eating meals, one meal a day. Me and my brother had to stop going to school," he said. His mother died in Nairobi as well. But something kept him going. "I would remember what my motivation was, what would my mom want me to do if she was still alive and even the fact that we went through so many hardships in life. I wanted to have a better future for my life and for my family." So when Arakaza arrived in Canada in 2009 as a refugee, he says it was one of the best moments of his life. Living in Ottawa for eight years, eventually he found work in Toronto. When he arrived at the Toronto Police Service, Arakaza immediately shone. "He stood out from day one," Sgt. Oliver Febbo told CBC News. "He brings a different perspective. He understands struggle, he understands sacrifice. Some of his experiences as a young child growing up through his adolescence has given him a depth in character that we desperately seek." That's exactly the kind of empathy Arakaza wants to bring to the Toronto Police Service. "Not everybody had an easy past or an easy childhood. Not everybody has the same financial situations in life," he said. Whether it's on a routine traffic stop, a domestic call or another situation, his aim is to have compassion and try as much as possible to get to know the person he's dealing with. But he has a message for refugees too — one that took off on social media in a tweet by Toronto police. "I really came from zero to wearing the police uniform that I am today," he said in the video. "I came here as a refugee myself and I know that in this city there are so many people coming as refugees ... I wanted to inspire you if you came here as myself from difficult circumstances." And there are more good things in Arakaza's future. At the end of January, he'll receive his badge and will be ready to serve the community. "I'm probably going to cry. I've been waiting for this moment for a long time," he said. "So it's a dream come true." 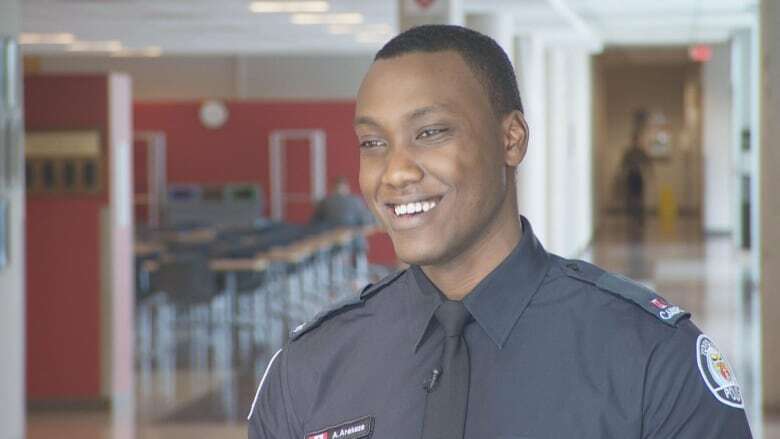 "Ten years ago [when] I was in Nairobi, I would have never thought I would be sitting in the Toronto police cruiser serving the population of this amazing country that welcomed me."